So, I’m a long-time fan of the Power Rangers, but more than that, I love the franchise it came from, the Super Sentai series. Each year is a new series with a new theme and cast, but there’s almost always (these days) a cross-over movie to introduce the new team and callbacks to previous shows. Power Rangers is a little different, a bit more kid-friendly, with easier-to-follow plots. 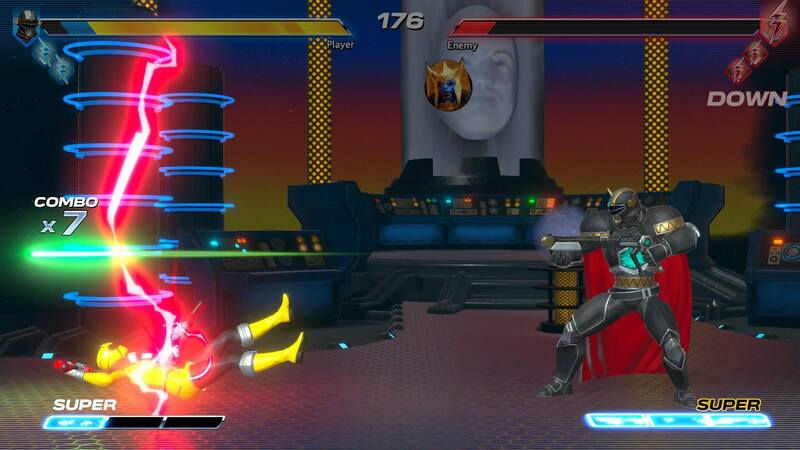 I enjoyed the mobile Power Rangers game, Power Rangers: Legacy Wars and this fighting game feels like a combination of Legacy Wars, plus Marvel vs. Capcom 2 or 3. 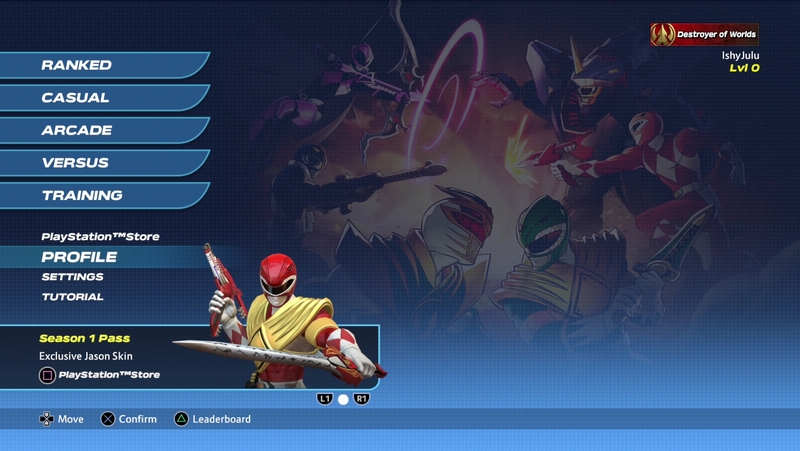 Players control a team of three Rangers and do battle against either other players online, or in the Arcade Story Mode. The word “story” is very much a misnomer though. There’s also Versus, for couch competitive, and a Casual Mode, for online casual matches. Don’t forget Ranked! That’s also here – you play three matches against the PC, then go into your actual player qualifiers. I will say, Ranked felt very good. I had no lag, input or otherwise. I was kind of hoping for the Evil Green Ranger, but we do have Lord Drakkon. That’s good enough. Battle for the Grid is very barebones in terms of UI and introduction to the game. The “moves list” just shows what all of the buttons do, since there aren’t many “super attacks” in the game. There’s a Special Button, and hitting it, and Forward/Backward and Special will do a variety of attacks, and some characters have Specials in the air. It’d be nice to know what these do without having to experiment or get an explanation on what they do. The Ranger Slayer (Alternate Pink Ranger) for example, can set some kind of bomb-looking attack in the air in one of her moves. It doesn’t last long, so you have to really know someone’s going to hit it. She’s also one of the few characters I’ve played that have varied moves. In many fighting games, hitting other directions alongside your attacks give new/alternate moves. 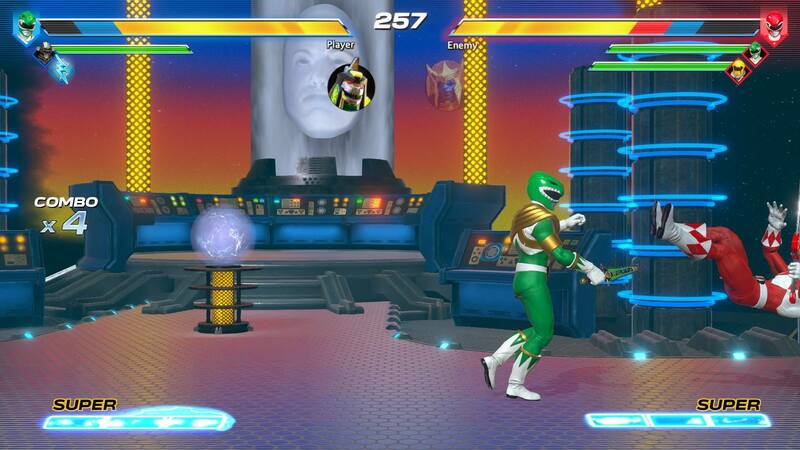 Other than crouching or in the air, this is not really the case in Power Rangers: Battle for the Grid. However, Ranger Slayer can fire an arrow into the air as an anti-air option. The overall UI could use some cleaning up. I do like the art in the background though. One of the other flaws in this game is the Arcade Mode has virtually no story. I played a series this morning where three or four of the fights had Magna Defender. This game only has nine characters, so seeing the same character on every team was very off-putting. There is a Season Pass, and it’s 15 bucks (almost as much as the actual game, at 19 bucks). It will add three more characters, and you receive Jason (with Dragon Shield) immediately. I will say, to their credit, they are giving out a free DLC update that gives three more characters – Dragon Armor Trini, Udonna (MagiMother) and Cenozoic Blue Ranger. I think these characters should have already been in the opening release because a fighting game with only nine characters these days is practically unheard of. I’m grateful this wasn’t a 60 dollar game, because I would have been overwhelmingly disappointed. I was really hoping for some of the main themes too. The actual gameplay is solid, though. It has a hidden resource to prevent infinite combos, where, when the attacking player runs out, the defending player breaks free and flips backward. The basic attacks (light/medium/heavy) have auto-combos that come from mashing, but you can make your own combos, throw in assists, and even summon one of three giant fighters to help you! I only say “fighters”, because two are Zords (Megazord, Dragonzord), and the third is Goldar himself. The assists feel solid, the attacks are fierce and feel authentic to the Power Rangers shows and brand. However, I’m disappointed there are no character sound-bytes/audio. I was hoping for some snarky back and forth, not the occasional grunt or cry of pain. Each character plays differently, as well. Though your basic combos tend to knock your opponent quite a distance away, you can cancel move animations to extend combos, and use assists, but the game definitely doesn’t teach the cancels and doesn’t show you how useful (or the dangers) of push-blocking. 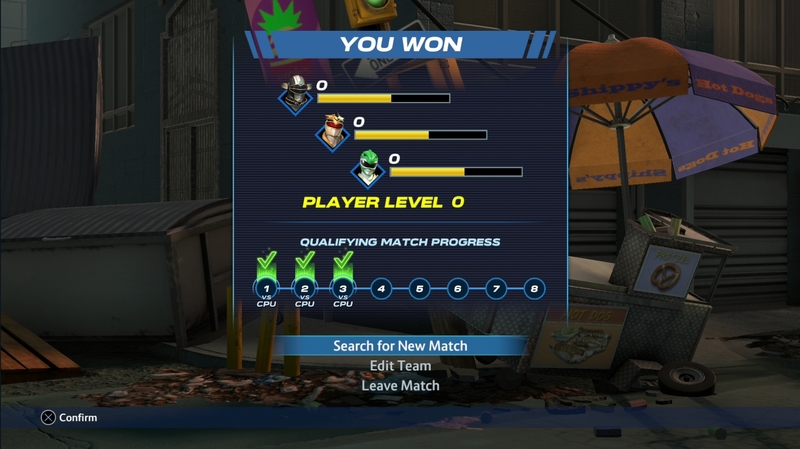 Fun fact: I absolutely stomped my first real ranked match. A prime example is Magna Defender, who is, in my estimation, one of the stronger in-game characters. He has a special attack that counters in-coming melee with a brutal combo, has a ranged shot, and his ultimate attack is a rapid-fire burst from his rifle. His Ultra Attack (L1+R1) appears to have armor and deals quite a lot of damage. Being able to summon a giant foe to aid you once per battle is also satisfying. You get a danger notification when it’s about to descend, and knowing what it does and in what order can help you set up attacks or avoid your opponents. Treat this like a comeback mechanic, or a way to seal the deal at the end of a battle. Combat is fun, and I really like the picks of characters. There are several comic book characters, one of the recent movie Rangers is coming, and some of the non-main Rangers were selected (EG: Kat/Deka Swan). Despite the flaws in the game – the small cast, the bare-bones UI, I still very much enjoy this game. I think it definitely needs some fleshing out, but I’m glad that it’s not a full retail game, and is instead just 19 bucks. One of the things I’ve gone on record saying in the past is if a fighting game were considerably cheaper, I’d feel less guilty about buying Season Passes, and I stand by that in this case. But it’s 14 bucks for three characters, so essentially 5 bucks a Ranger. I just hope they won’t feel like clones of other characters. Power Rangers: Battle for the Grid can do a lot, and while I do think it still needs a little bit of chutzpah, It still makes me want to grab a morpher and yell, “It’s Morphin’ time!” I’d like to see the Arcade/Story mode offer an actual set of stories, I’d like it to have more variety in the opponents you face. I’m wondering though if this free DLC pack is just to satiate players that think the cast is too small. Will we see more free characters in the future? That will definitely influence how I feel about it going forward. I am wondering where the classic songs are too! Where’s “Tengu-Bye-Bye”? Where’s “5-4-1”? Another thing I’d like to see is a bio section for the characters. There are Rangers/Villains that might be new to lapsed/returning fans, so let’s see some character bios! It’s got a lot on the ball, but it’s not a Fighter of the Year candidate. Not yet. I am in total agreement with this review. It has many flaws, but it’s still a blast to play. It feels raw, but with room and time for improvement. Thanks for another great review Jason.